There are rare feats in local cricket such as a double ton or taking half a dozen wickets, then there’s what the Zealley boys accomplished on the weekend. 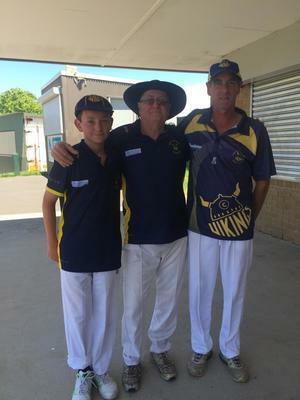 The Zealley name is synonymous with the Carlisle Park Vikings and on Saturday, three generations of Zealley’s – Geoff, Rodney and Ryan – all played for the Vikings in the WGCA one-day competition at Barry Simon Reserve. Geoff ‘Pops’ Zealley has been with the club since its inception in 1994 and was awarded life membership in season 2004/05. Having played 194 games, ‘Pops’ has taken 227 wickets, with his best ever figures being 6/3. His son, Rodney has played 66 matches for the Vikings, whilst grandson Ryan has played 28 since debuting in the Under-12s in season 2015/16. To have three generations playing at a club all at once is impressive, but to see them all suit up in the same game is a moment that those at Carlisle Park won’t soon forget. Taking on Gembrook, Carlisle Park struggled with the bat and was unable to fight their way back. Mohammed Shafai (32) top-scored for the Vikings and unfortunately, Rodney (8) and Ryan (8 not out) were unable to get going. Defending a total of 113, the Vikings couldn’t contain the Brookers as Timmy Gray (69) was in dominant form. Geoff (0/26) bowled three overs and Ryan claimed Konner Allcott via a run out. Despite the loss, there’s no doubt it was a monumental moment in the history of the Carlisle Park Vikings. Tooradin claimed an impressive win over Emerald. Needing 241 for the win, the Seagulls had great contributions across the board, led by half centuries to Peter Stone (59) and Owen Johnstone (50). The lower order ultimately led the Seagulls home as Adam Splatt (24 not out) and Alex Johnson (23) helped Tooradin to the win with a total of 8/242. Cranbourne Meadows restricted Aura Vale to a total of 173 and claimed a strong win over the Lakers. With five batsmen getting strong starts for the Rebels, it was Jasmeet Virdi (40) and Sami Muzaffar (32) who stamped their authority to lead Cranbourne Meadows home, posting a total of 4/176. Officer was too strong for Catani, defending their total of 208. The Cats were in strife from the beginning as they struggled their way to 3/36. It didn’t get much better from there either as Steve Pursell (2/2) and Daniel Irvine (2/8) dominated Catani’s batsmen to have them all out for 110. Carlisle Park’s total of 134 wasn’t enough as Devon Meadows claimed a comprehensive win. Mick Floyd (64) belted a half century, while Bill Loudon (42) was also impressive as the Panthers posted a total of 175. Lesley Howell (3/22) was best for the Vikings. After all C Grade games were abandoned last week due to wet weather, one-dayers were played on Saturday. Cardinia and NNG/Maryknoll played out a classic. The Bulls batted first and Matt Celima (103) was in devastating form to lead his team to a total of 9/171 in 40 overs. His century included seven 4s and five 6s as he punished any wayward deliveries. In reply, the Marygoons fell just short as they ran out of overs. Tail-ender Ashley Bailey (34) almost led his team home, but they fell seven runs short of victory with a total of 8/165. Pakenham Upper-Toomuc and Clyde also played out a nail-biter. The Cougars posted a total of 6/147 as Kapil Lekamwasam (40) and Thomas Sinnema (29) were impressive down the order. In reply, the Yabbies got off to a flying start with openers Justin Harris (48) and Matt Southall (30) on fire. Wickets fell thick and fast for the remainder of the innings though, but with just one over to spare, the Yabbies reached the target with one wicket in hand. William Round (4/21) was almost the game-winner for the Cougars. 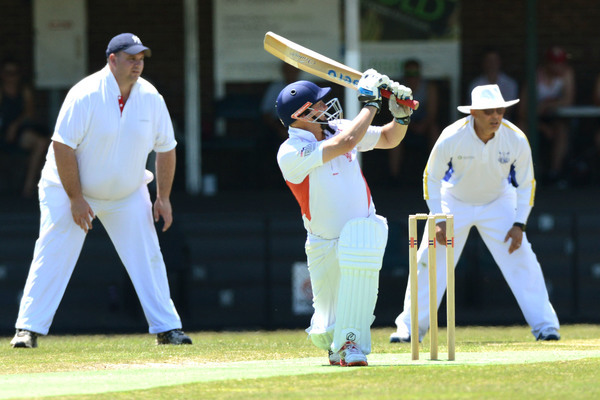 Officer did enough against Upper Beaconsfield after restricting the Maroons to 114. Paul Simon (3/7) and Antony Pesch (2/12) bowled well as Upper Beaconsfield struggled to get runs on the board. Ben Amos (37) was the only Maroon to make inroads. In reply, Daryl Hargreaves (43) and Matthew Lucas (36) led the Bullants home as they reached the target in 37 overs to claim a four-wicket win. Cranbourne Meadows set a defendable total against Pakenham, but the Lions batsmen obliterated the Rebels bowlers to claim a big win. Ajith Venkatesan (40) top-scored for the Rebels, while Terry Smith (4/42) claimed key wickets as Cranbourne Meadows posted a total of 9/175. The Lions were simply ruthless with the bat as Scott Webster (80) and Sean Gramc (60) smashed nine 6s between them as Pakenham reached the target in just 22 overs. Kooweerup claimed an easy win over Lang Lang. After restricting the Tigers to just 76 as Adam Wilkinson (5/8) shone bright, the Demons reached the target in the 24 overs to claim a six-wicket win as Scott Gray (41 not out) impressed. NNG/Maryknoll lost in a high-scoring battle to the Victorian Vikings. Posting a total of 228 – led by Nick Bransgrove (50), Geoffrey Ball (49) and Alan Downes (42) – the Marygoons looked in control, but the Vikings had other ideas as they chased down the target in 36 overs with one wicket in hand. Pakenham claimed a win over Carlisle Park. Chasing a total of 165, the Lions almost ran out of wickets, but hung on for a one-wicket win, posting a total of 9/170. Rupinderjeet Brar (5/52) was dominant for the Vikings. Merinda Park’s massive total of 351 was too much for Emerald on day two. The Bombers were valiant – led by Stephen Moore (86) – but it wasn’t enough as Kanwaljit Handa (5/74) and Brock Jenkins (3/50) claimed key wickets to dismiss Emerald for 253. Tooradin claimed an outright win over Officer. The Bullants were dismissed for 62 as Wayne Mannix (5/23) dominated. In reply, the Seagulls declared at 8/181 as Kaine Bundy (72) smashed Officer’s bowlers. Facing an outright loss, the Bullants struggled from the outset in their second innings as Kaine Bundy (4/6) and Jack Mannix (4/20) had Officer all out for just 66 to claim the outright win. Cranbourne Meadows was too strong for Pakenham Upper/Toomuc. Defending a total of 8/148, the Rebels scorched the Yabbies batsmen to have them all out for 94 as Geoff Bradshaw (3/12) and Brodie Matthews (3/15) impressed. Catani defeated Clyde as they chased down the Cougars total of 158. Chris Duncan (57) and Bill Purvis (46) led the Cats home. Nyora defeated Devon Meadows, defending their total of 192. Aidan Simmons (62 not out) and Keith Maclure (43) were standouts for the Maroons. In reply, the Panthers were dismissed for 176, despite the best efforts of Peter Zauner (76) as Jake Henry (3/20) bowled well. Clyde claimed a tight win over Merinda Park Red. The Cougars’ total of 9/180 was enough as the Cobras could only manage 8/169. Devon Meadows took the points against Cranbourne Meadows, defending their total of 8/208. Shannon Marrell (95) almost led his team to victory, but it wasn’t enough as the Rebels were dismissed for 187. Cardinia claimed the win over Pakenham, despite not being able to claim outright points. Leading by 72 after both teams first innings, the Bulls went for an outright win but the Lions did more than enough to hold them out as they posted a total of 6/141. Merinda Park White won on forfeit over Pakenham Upper/Toomuc.